I never really tasted corn until I moved to México. That seems odd to say since I grew up in a rural Pennsylvania community and had corn-on-the-cob freshly picked from our garden every summer, helped my mom freeze corn in August and had corn with most meals throughout the winter, but it’s true. I never tasted it before. I thought at first that it was how my husband cooked the corn. 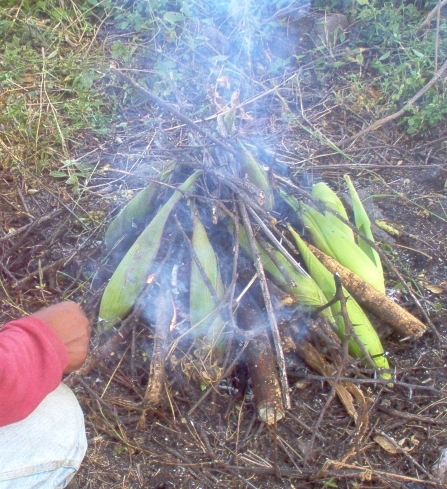 When he boiled the elotes (corn-on-the-cob) he left an outer layer of leaves on them. Then instead of butter, we ate them with lime and salt. But it was more than that. 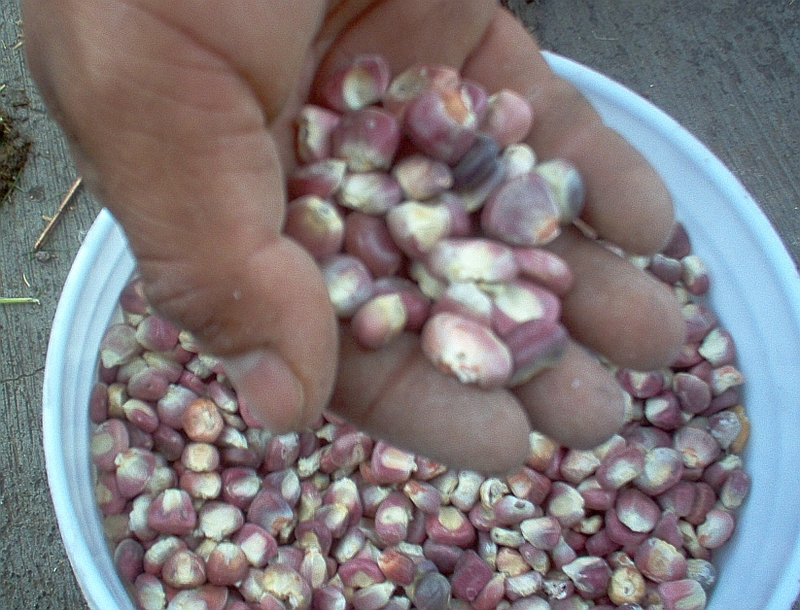 México has more than 200 native varieties of corn. There is yellow sweet corn, yellow, not sweet corn, white corn, purple corn, red corn and blue corn all of which come in large, medium and small kernel size to name a few that I have sampled. And nothing compares to the taste! Each type of corn has its own specialty dish. Yellow corn for gorditas (fat small tortillas for stuffing), white corn for tortillas, reddish-purple corn for pozole, etc. For awhile, I was concerned that Monsanto would make it big and destroy the natural diversity Mexico’s corn. However, GMO corn has been officially outlawed, although Peña Nieto’s new reforms that allow foreigners to own parts of México doesn’t rule out Monsanto continued and future interference entirely. This ban does not include other crops, such as soy and cotton, so México is not GMO-free. However, corn, or maize, is such a part of the fundamental culture here, that protesting campesino (farmer) groups were able to rally under the slogan “Sin maize, no hay país” and in November 2013, force the Méxican government to listen. So since corn is a staple part of the diet, we had to plant some ourselves. As our property is a mere 14 x 20 meters and nearly fully occupied by our home and animal kingdom, we had to ask around to see if we could borrow a bit of land to plant on. We didn’t have too much problem making the sharecropping arrangements, and we were off. It meant clearing off the grasses and barbechando (taking the plow over it a few times), but with the help of Red, it was done in a matter of days. Next came the planting. 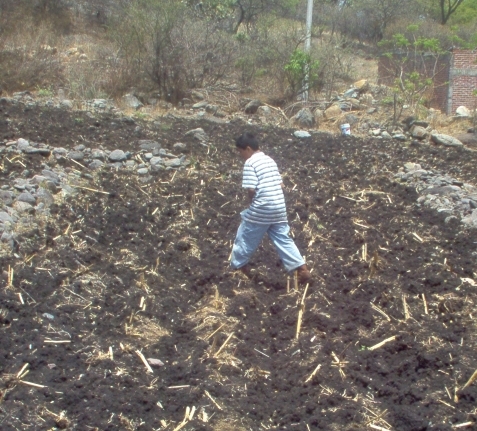 We planted in the traditional way with las tres hermanas (the three sisters) corn, beans, and squash. The corn stalk supports the bean plant, and the squash grows along the ground. My husband dug the hole and my son, and I dropped in the seeds. Afterward, my husband tied a large branch to the back of Red and went over the mounds to smooth them out. Again, no more than a few days work. Then we waited for the rain. 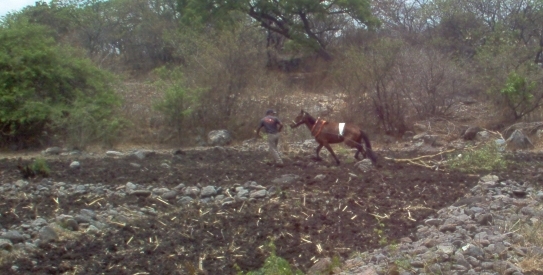 Planting is typically done in this area, central México, after the first day of summer, which marks the beginning of the rainy season. If you are feeling frisky, you can plant earlier, but you risk your newly sprouted corn drying out while waiting for the rains. We try to wait until there have been 2 or 3 days of rain before planting. Not only is the ground easier to work with, but there is less chance of crop failure. But you never can tell. A season that starts out well may not bring enough rain for your plants. This past year, we had to replant a section of our corn because it just didn’t grow well because of spotty rainfall. The enormous varieties of corn available in México, ensure that there is a type of grain for each climate, soil, and elevation. As these corn varieties have been developed over thousands of years, the introduction of homogenized genetically altered corn would upset the delicate balance that allows for the continued adaptation of the plant. 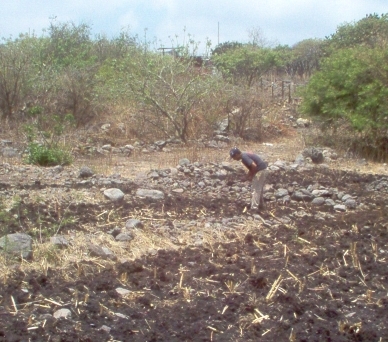 Throughout the rainy season, my husband spent an hour or two each day hoeing our rows of corn. When he had finished all of them, he started in at the beginning again. We hadn’t planted acres and acres, but a manageable piece of ground, about an 1 1/2 acres is all. My husband, of course, was all for planting more, but I pointed out that the years we had planted more, we had harvested less. It was just too hard to maintain properly. 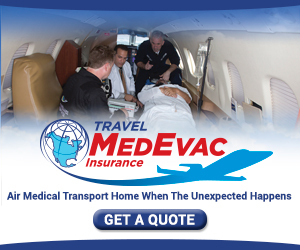 So we contented ourselves with what we could reasonably do. We do not use any sort of pesticides on our crops. Of course, the chochos (grasshoppers) love that. But we don’t feel the need to exterminate the species to protect our plants. 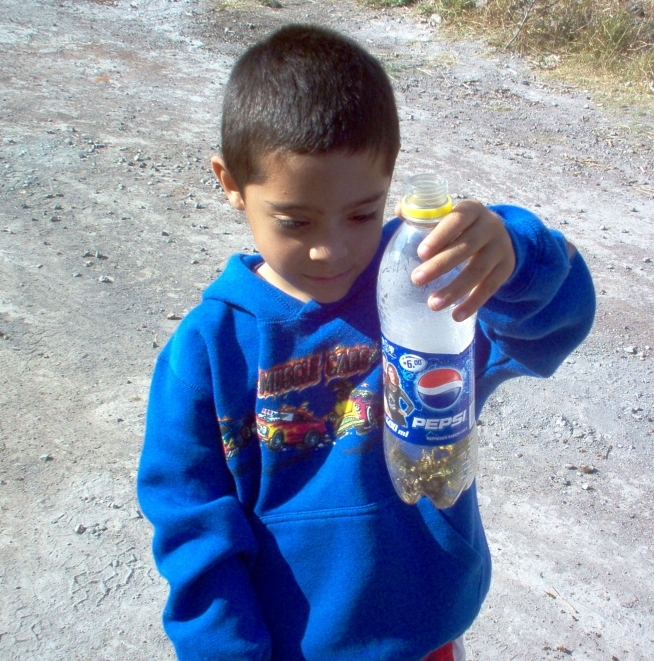 Every morning, when the chochos are still in a deep-freeze sleep, my son heads out and plucks them off the leaves and puts them in a plastic soda bottle. When the bottle is full, he empties it in the chicken area for them to enjoy a scrumptious protein-rich breakfast. Any that escape, are welcome to their lives. Any that return to feast on our corn leaves could be subject to being eaten tomorrow. Before too long, we had small, tender calabacitas (squash) to enjoy. My husband makes this scrumptious dish of squash, tomato, and onion that we had an average of once a week while the squash held out. Then, the corn was ready. We had a chivada (corn toasted over an open flame) every second day or so. Incidentally, the word chivada was a new one for me. The first time I heard it I thought we would be having roast goat (chiva). But it’s only corn. I believe that the word began once upon a time as a poor man’s version of a goat roast, a play on words. The beans were ready after the corn and yummy! The tender, fresh picked beans were absolutely delicious in taquitos dorados (fried tacos). Those that we didn’t eat right away, we set out to dry for future meals. 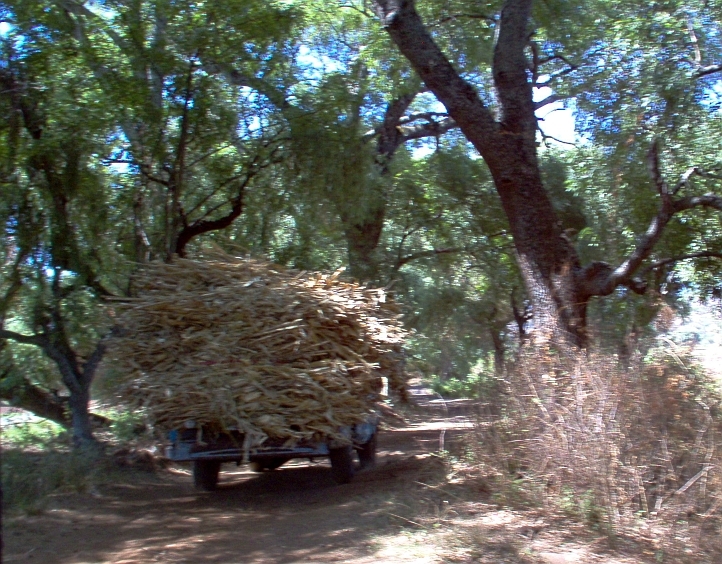 The corn plants eventually dried out in mid-October. When there were no more ears to be had, my husband chopped down the stalks and set them to dry. The chopping and stacking took the better part of a week. Once they were completely and utterly dry, he had a machine come and molir (grind) the rastrojo (corn stalks) into a coarse powder that we feed our animals mixed with other grains throughout the dry season. The machine is rented by the hour, so this chopping and stuffing into costales (sacks) is done by the end of the morning. Once the corn plants were finished, my husband planted a few rows of garbanzo as a winter crop. Planting after the rains are officially over is risky if there is no irrigation. However, we have the attitude that if it grows, it grows and if it doesn’t we let the goats graze in it. Our efforts at agriculture provide enough feed for our animals so that we need to buy very little to maintain them. If it becomes too hard to feed our animals with what we have harvested, we know that it is time to cull the herds and flocks. What the milled fodder looks like. First harvest here in Mexico after only a few months full time living….now getting squash and cooked our first today. Not bad. The beans are all dried and stored, corn dried out and will be looking for a way to crack the corn. Do you use a manual grinder or another method? Kinda clueless here….thanks! The last few harvests we have ground most in bulk and stored it for our animals. We dried some and had pozole periodically. We don’t have a small grinder, although I would like to get one. When we want a bucketful, we take the dried corn to the local molinero and they grind it there for us to use in tamales or tortillas. Update: I just bought a small manual grinder with the intention of hooking it up to one of the drills but it was so easy to use that I just ground by hand. I am using it for cracking the dry corn for the chickens and can adjust it for what can pass for corn meal. Looks like I could sift out some of the larger parts but I will try using it for corn bread and report back. I remember paying about 350 pesos or so.